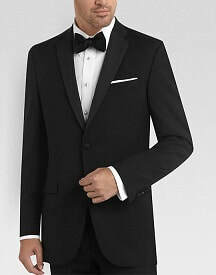 Tuxedo formal wear is for a very special event, like a wedding or a black tie dinner. You need to show up looking your best…and looking the part. Whether it’s your own wedding, you’re the best man, a groomsman or father of the bride, you want to look your best. Going on a cruise? You better pack that tux for dinner with at the Captain’s table. Giving a speech at some big time political event in town? Your choice of outfit will set the mood of the event, and wearing a tuxedo will set you above the rest. Tuxedo rentals have long been THE major component defining a man’s status and helping him to achieve his goal of "looking the part". Whether it’s for a wedding or a prom or a cruise, wearing a tuxedo will give you the look you need for the occasion. Today's styles allow you to choose the look you want. You can mix styles, colors, and accessories to achieve your desired look. A Tux is too formal you say? Well, consider that you have the choice to rent a suit rather than a tuxedo. If the event is formal but not Black Tie, or if you just don’t have the right suit for the occasion, why not rent one? And speaking of the right style, do you have the right shoes to match the clothes? The style of shoe you wear is equally as important as the style of the tuxedo or suit and don’t think that the shoes won’t go unnoticed. Shoes complete the outfit and you don’t want to blow it by having old, cracked, or simply inappropriate shoes that ruin an otherwise great look. Today’s technology gives you the online tools to get a jump start on your tuxedo rental process by checking out the styles and colors available. You do not have to go to a tuxedo rental store to find the style you like. By getting a jump on the process and browsing online first, it will give you an idea of what look you want before going to a tuxedo rental store. If you are getting married and there are groomsmen who live out of state, they can go to a tuxedo rental store in their town or city where they live and get fitted, then send the measurements to the tuxedo rental where the groom is renting from. It is easy and convenient, and all your outfit need are completed, including shoes and even socks. Why spend the money to own when you can rent a beautiful suit or tuxedo? Renting is easy, you will look great on the big day, and when it’s over just return the items. You don’t even have to clean it after you wear it. Plus, when you own a tuxedo, you run the risk that while styles move on, your tuxedo won’t. You’ll end up with a outdated tuxedo that spent hundreds of dollars on, only to end up renting anyway. The style of tuxedo you rent is important, and each one we offer is made by one of the leading fashion designers from around the world. Whether it is Jean Yves, Calvin Klein, After Six, or Ralph Lauren, you will be fitted to a luxurious suit or tuxedo by our expert tailor. There are numerous styles and colors to choose from that will make it able to match the gown or dress of your partner. From a traditional black & white tuxedo to something seen on the red carpet worn by a Hollywood star, whatever color or style you want can be found here at Commonwealth Cleaners of Easton.